The Suspicionist: JADE HELM ------- Just a silly right-wing fantasy -------- Or IS IT? JADE HELM ------- Just a silly right-wing fantasy -------- Or IS IT? *Please Note opinion from source site ("so what we have here...") superimposed over chart above), and keep separate from factual info. 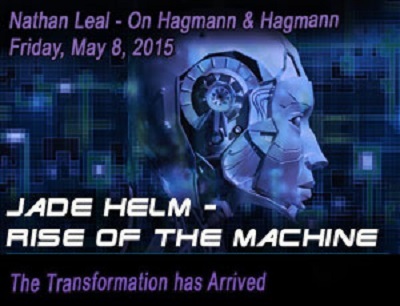 On some levels, the issues and speculation that have accompanied the preparation for the upcoming, massive Jade Helm (AKA "Jade Helm 15") military-training operation in a number of western states including Texas, are amusing ---- The supposed "takeover" of Texas (already a very Conservative, pro-corporate, pro-military state), mass-shootings, and the Chinese invasion angle, especially. Alright, those parts, and other spinoff-ideas, are dumb. Over-the-top, paranoid web sites on Jade Helm are numerous and easy-to-find, and I won't link to any here. For this particular issue, virtually all of the level-headed concern (and there is some), as well as the more publicized paranoia, wild theories and conspiracy-ideas, seem to be clustered on the Conservative side of the political spectrum. To the Progressive side, Jade Helm is a non-issue, except for the opportunity to mock "those silly wingers on the other side". But should it be a non-issue for Progressives and Liberals? Is there more to this issue? and deferential, has been reversed. Odd, that. It is the major media who are energetically putting some of the wacky ideas front-and-center, and presenting them so prominently as to frame, and seemingly discredit the entire issue as rural Conservative paranoia. 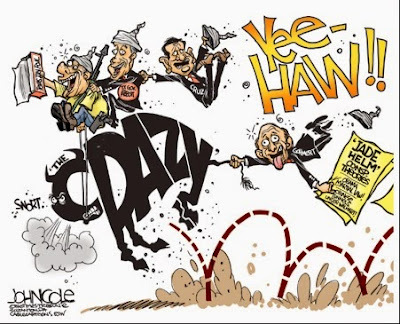 This apparent "slant" in the reporting compelled me to wonder ---- why are the corporate-media so determined, right from the get-go, to frame concerns about Jade-Helm as, "wacky"? Then I decided to look deeper. I admit to being a political Progressive who constantly questions Conservative or "establishment" ideas. 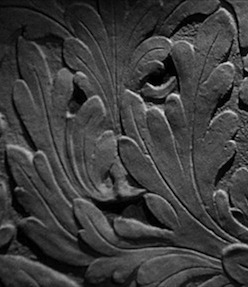 But now, after some re-thinking, I refuse to entirely write-off the "other side" on this issue anymore, even though some claims are unequivocally outlandish. throw out there so easily. There have long been military-training exercises all over America. 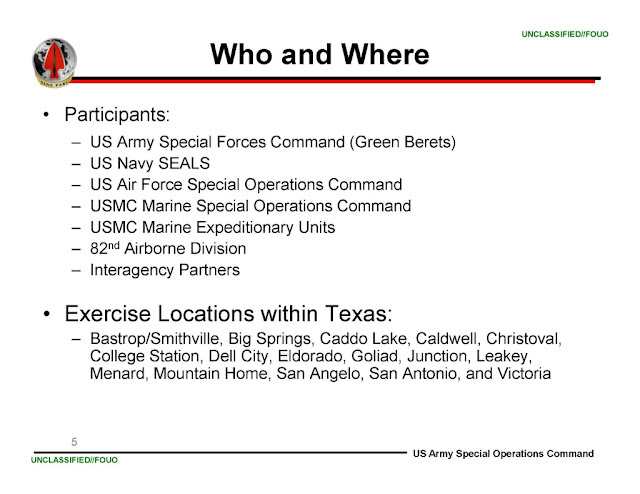 The big questions about this one are ---- Is Jade Helm different from the others? Why is so little known about it, and also, what is the purpose behind it? 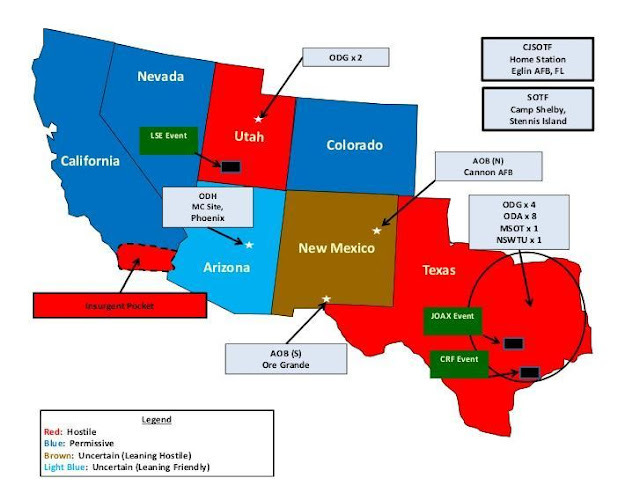 There's not a ton of info out there about Jade Helm, as much of it seems to be classified (except for official disclosures such as in the diagram/panels at top of page). 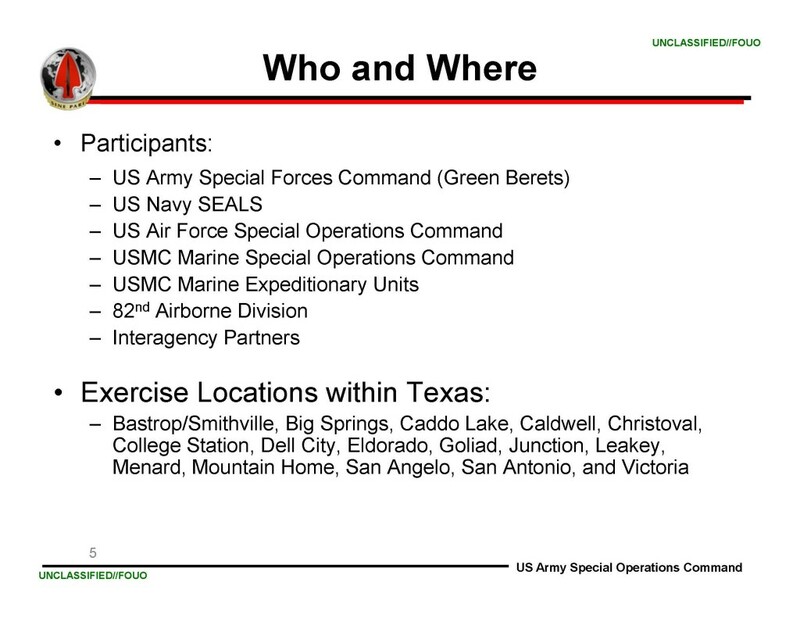 Jade Helm does not appear to be just another round of conventional "War Games" for combat troops. It is described as a new type of "counterinsurgency"-training for ONLY elite commando-type units (like the team that got Bin Laden, and others), in all branches of the military, operating in different states, practicing local infiltration and reconaissance as well as having military materials necessary to the operation moved-around and made ready as they would be in an actual combat-defense situation. 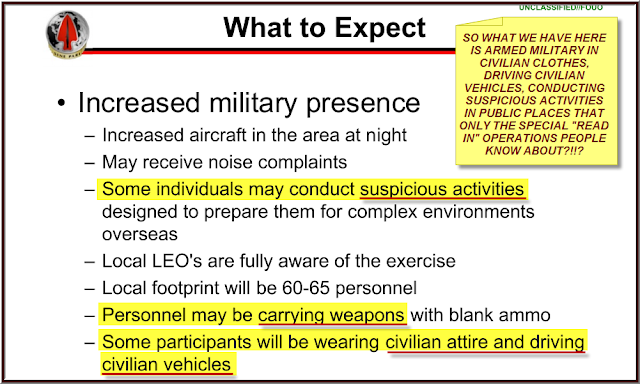 There is more to it ofcourse, but little else is directly known, except that local law enforcement officers will be notified and prepared ahead-of-time for some public reaction to the exercises on a local level, as they occur (i.e. anticipated citizen reports of "people acting suspiciously" in their communities or surrounding areas). So OK. It's large, it's new, it's innovative, it's to protect the country, etc etc etc. But I still have some questions. Sooo ... Who the heck are the "insurgents" these special military teams are being trained to counter, target and neutralize? Al Qaeda or ISIS "death squads" loose in the US? 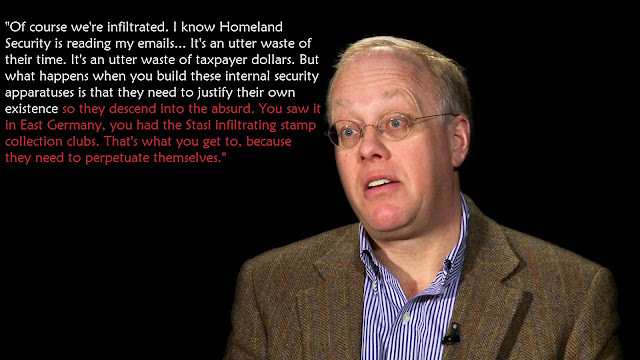 Clive Bundy-types? Rightwing neo-military survivalists? The next version of Occupy? Code Pink? Future Anti-war demonstrators? And how can training in American towns and communities prepare special Ops for fighting "insurgents" in countries like Afghanistan, Iraq, Syria or Pakistan? This part is extremely unclear. One thing is for sure ---- Once the machinery, strategies and protocols are worked out and established, they can be used for other than the originally stated purposes. As a Liberal, I naturally have a distrust of the Military Industrial Complex, with its huge political clout, and I share, along with increasing numbers of Americans, an uneasiness with the ever-growing vastne$$ of the US military, and its oversized budget, in general. Emphatically, I suggest other Liberals who share those sentiments apply them in this case. If you do, you may find yourself having a few creepy doubts about this operation yourself, even if the silly "flagship" parts of the story (takeover of Texas, mass-executions of Christians, "FEMA death-domes" etc), seem extremely stupid and are easily-mocked. Think beyond the distracting "dumb stuff" up-front. 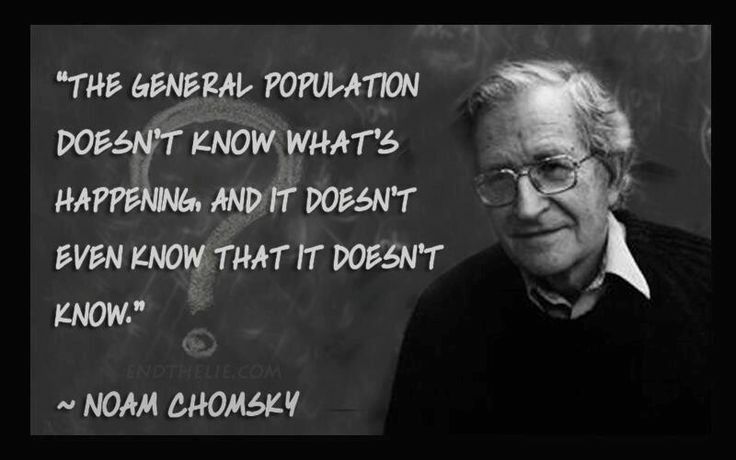 Have the crazy-sounding, "paranoid" ideas put out by the media, as shown in the statement and image seen below, been distracting people away from any real discussion about this issue? 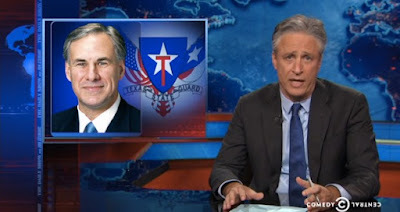 Although liked and respected by Liberals, has Progressive-leaning TV comedian John Stewart's mockery of Conservative fears about Jade Helm helped close Liberals' minds to the full implications of this issue? 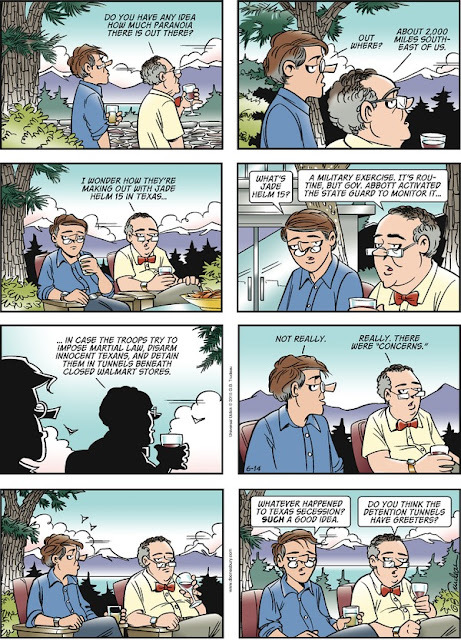 (By Gary Trudeau/June 14, 2015). But are Liberals missing something on Jade Helm? Are they being played on this issue? OK, where's the cui bono? You shouldn't have to be a raving conspiracy-theorist to see some potential sense of threat behind these rather mysterious, but BIG, military special-forces exercises, which involve some degree of what is described as "local infiltration" and surveillance. security-state measures and preparations put in place -- in anticipation of mass civil unrest, possibly in response to an economic collapse or controversial new war. 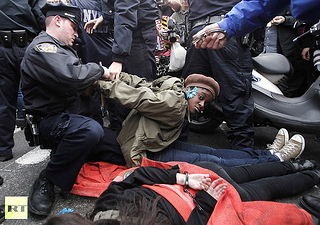 The current uncertain social-economic-political atmosphere in America, as the background for the exercises, would suggest this possibility, and the overall picture grows slightly more ominous when seen in light of the current trend in America towards the militarization of local police forces across the country, which has been well-documented, along with many examples of excessive violence used against citizens, coast-to-coast. Also, Progressives would be foolish to forget the police-state-like suppression of the Occupy Movement just a few short years ago ---- A policing policy which was certainly a cui bono for financial and corporate elites made uneasy by Occupy's decidedly anti-elite message. Liberals and Progressives need to put Jade Helm in this context, away from the lunatic raving, and see this as a potential preparation for dealing with political resistance coming from the masses. Including the Left-leaning masses. This is the frightening possible cui bono for The Authoritarian State that many fear is emerging in America. 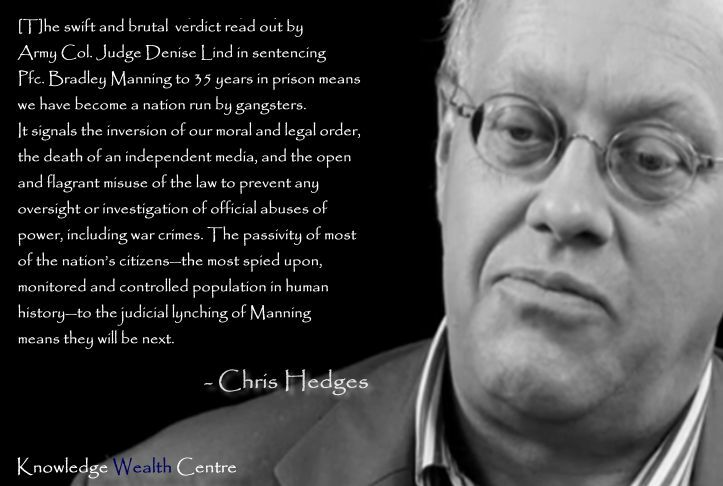 Plenty of smart people on the Left, like Chris Hedges and others, have warned about the shift in our American system to a more militarized, potentially repressive state, in order to enforce the corporate-run order in a society of more and more purloined resources and wealth, taken away from the American People by ultra-wealthy elites. That isn't conspiracy theory. That's just the big picture, seen clearly. 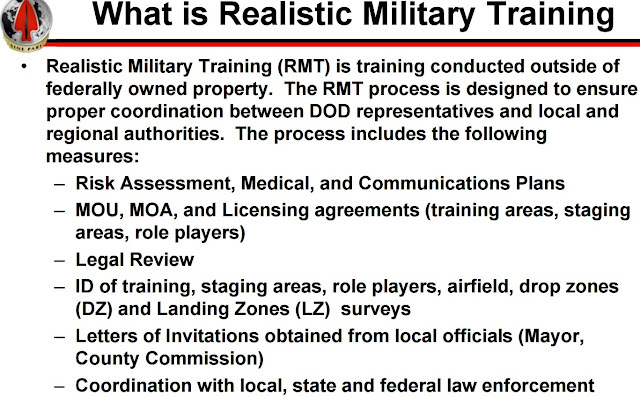 So OK, maybe Jade Helm is just a standard training exercise, nothing to see here, etc. But at least think it through before writing it all off right away just because it is presented as a "right-wing" fear-point with some outlandish spin-off ideas. If you are a Liberal, and say, Jeb Bush were President and this operation was being planned as is, would you still feel the same way about it? Does Jade Helm violate The Posse Comitatus Law? Posse Comitatus Act -- A United States federal law (passed, 1878) prohibiting members of the military from exercising powers that maintain "law and order" on non-federal property. Critics of Jade Helm note that the military is not intended nor designed to function as a law enforcement body, and that soldiers are not trained to evaluate the legal nuances of probable cause or to safeguard the rights of civilian detainees." "The media have done a grave disservice by repeatedly mis-characterizing Texan citizens as hysterically complaining of a 'takeover' of Texas. In fact, the video record shows questions from the audience at the military’s city council presentations to be calm and reasonable. At no point does anyone accuse the Army of plotting to 'take over Texas,' a recurring catchphrase in the mockery of Jade Helm critics. At a Bastrup County meeting, one man expresses concern over 'increasing indications that the military is getting a little too involved in civilian law enforcement.' 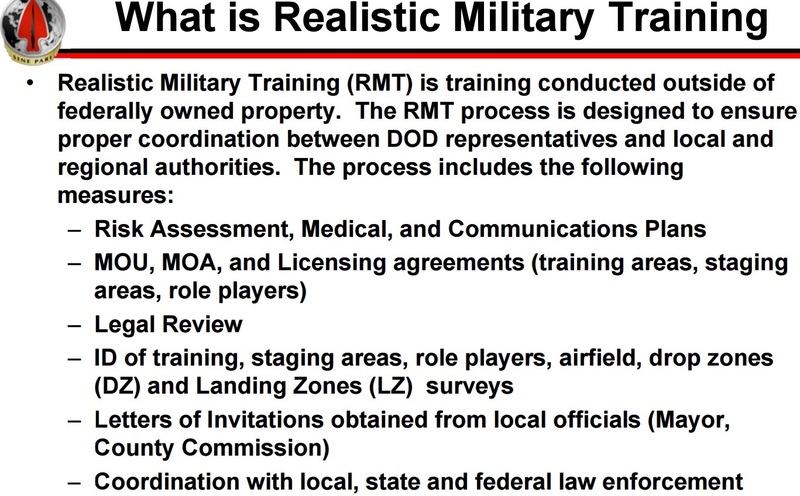 "
Does Jade Helm violate Posse Comitatus? Is Jade Helm a Psy-Op? The next link below is to a very strong-opinioned article on Jade Helm from a site called, beforeitsnews.com.